The parts that make up a hinge will vary in appearance for different hinge types and styles, yet they still perform the same functions. Reversible hinges may be used on either left or right-hand cabinet doors. 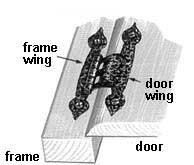 Frame Wing: Part of the hinge that attaches to the cabinet frame. 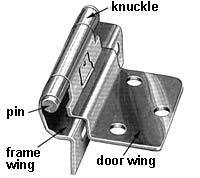 Door Wing: Part of the hinge that attaches to the cabinet door. Knuckle: Connects the frame wing and door wing and allows rotation. Pin: Holds the hinge together. Full Wrap-Around: Frame wing wraps three sides of the frame and screws to the inside edge. Partial Wrap-Around: Frame wing wraps two sides of the frame and screws to the edge. The frame wing is visible when the cabinet door is closed. The door wing is concealed. Both wings of the hinge are mounted to the outside surfaces of the cabinet door and frame. The frame wing is visible when the cabinet door is closed. The door wing is concealed and extends into the frame cavity. Frame wing wraps two sides of the frame and allows the door to overlap the frame. Frame wing wraps two sides of the frame and allows the door to overlap the frame, door wing accepts a door with the mounting edge sloping inward. Both wings of the hinge are mounted to the inside surfaces of the cabinet door and frame, concealing both wings and leaving the knuckle exposed.